An aristocracy of roadside attractions has been raised over the years: glorified in photo essays, calendars, blogs, and Tweets; spotlighted in video and film; instantly recognizable as icons. These Great Monuments, we are told, represent America's hopes and dreams, art and commerce, materialism and spiritualism, folly and fame. 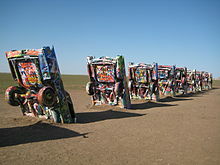 Standing along Route 66 west of Amarillo, Texas, Cadillac Ranch was invented and built by a group of art-hippies imported from San Francisco. They called themselves The Ant Farm, and their silent partner was Amarillo billionaire Stanley Marsh 3. He wanted a piece of public art that would baffle the locals, and the hippies came up with a tribute to the evolution of the Cadillac tail fin. Ten Caddies were driven into one of Stanley Marsh 3's fields, then half-buried, nose-down, in the dirt (supposedly at the same angle as the Great Pyramid of Giza). 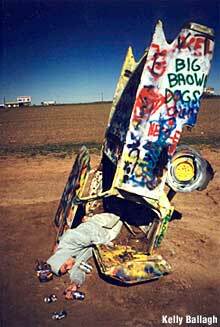 They faced west in a line, from the 1949 Club Sedan to the 1963 Sedan de Ville, their tail fins held high for all to see on the empty Texas panhandle. That was in 1974. 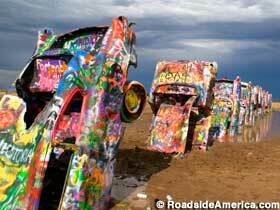 People would stop along the highway, walk out to view the cars -- then deface them or rip off pieces as souvenirs. Stanley Marsh 3 and The Ant Farm were tolerant of this public deconstruction of their art -- although it doomed the tail fins -- and eventually came to encourage it. Yet Cadillac Ranch is more popular than ever. It's become a ritual site for those who travel The Mother Road. The smell of spray paint hits you from a hundred yards away; the sound of voices chattering in French, German, and UK English makes this one of the most polyglot places between the UN and Las Vegas. We last visited just after a Texas-size downpour, and yet a steady procession of acolytes trudged through the ankle-deep mud to make their oblations. Many were barefoot, cheerfully slogging through the muck of livestock pee and poo (and parasites) and spray can trash, happy to be there. Despite its exposed location in an empty field, Cadillac Ranch seems to give its art-anarchists a sense of privacy and anonymity, like a urinal stall in a men's room. Individual painters take a stance facing one of the cars, then let it fly. Surrounding visitors keep their distance, perhaps less out of courtesy than from a desire to stay clear of the spray cloud. The Europeans really seemed to enjoy attacking the cars during our visit, maybe because they've lacked a good graffiti canvas since the toppling of the Berlin Wall. Tourists are always welcome at Cadillac Ranch. 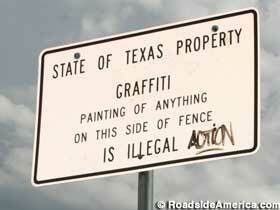 If you bring spray paint, make sure to also bring a camera. Because whatever you create at Cadillac Ranch will probably only last a few hours before it's created over by someone else. Just west of the Amarillo city line. I-40 exit 60. Drive south to the frontage road (old Route 66), then turn left. Drive east one mile. Cadillac Ranch will be on the right (south) side; just park your car along the shoulder and enter the pasture through an unlocked gate. Visitors are encouraged; dog friendly. The scenery steals the show on the Sandia Peak Tramway. The Tram, as it is affectionately known, has taken more than 9 million passengers to the top of Sandia Peak and back again, and celebrates its 44th anniversary in May. Located on the eastern edge of Albuquerque, New Mexico’s largest city, the Tram is one of the most popular tourist attractions in Central New Mexico. Although the Tram is an engineering marvel, visitors come mainly for the spectacular view - 11,000 square miles of the Land of Enchantment. 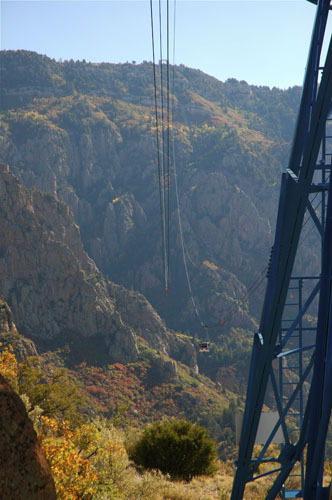 Passengers ascend 4,000 feet in about 15 minutes, gliding along the western face of the rugged Sandia Mountains. The granite rock faces, eroded into spires, cliffs and pinnacles, the aspens, hardy pines, scrub oak, fir and spruce, are home to many different birds and other animals. Tram riders may see an eagle or a mule deer or perhaps a black bear as they look out the windows of the cable car into the deep canyons. No matter what time of day, the view is unparalleled. West across the Rio Grande and a volcano field, Mount Taylor rises, more than 100 miles away. To the north is Cabezon, a stump of an eroded volcano, and other volcanic necks and plugs. To the north and west, Redondo Peak stands tall in the Jemez Mountains, rising from a caldera known as the Valle Grande, a volcanic crater reported to be the largest in the world. To the east lies the heavily wooded backside of the Sandias and, on the far horizon, the Sangre de Cristo Mountains and the capital city of Santa Fe. Farther to the south, the Estancia Valley and the Manzano Mountains frame the view. The view from 10,378 foot summit parallels what one might see from a very still airplane on a scenic flight. A trip to Europe by Robert Nordhaus, one of the founders and owners of the Sandia Peak Ski Company, inspired construction of the Tram. Nordhaus came back with the idea of a tram similar to those he rode in Europe and with partner Ben Abruzzo made the idea a reality. It would connect Albuquerque to the top of Sandia Peak, combining first-rate views with efficient transportation for skiers, avoiding a half-hour or more drive on an icy, curving mountain road. The tram took two years to move from idea to construction project. Its development marked by city and state hearings, financial planning and interest and skepticism on the part of the public. Because of the difficult terrain, topographical engineering, foundation engineering, and studies of the geology were required. An engineer from the U. S. Forest Service also was assigned to the project. Installing the tram posed considerable problems because of the steep, rocky terrain. Bell Engineering of Lucerne, Switzerland, the company contracted to do the work, had built more than 50 tramways throughout the world beginning in Switzerland with their first passenger tramway in 1888. Their engineers but readily admitted that the Sandia Peak project was their most challenging. Just stringing all of the cables up the mountain the 2.7 miles alone took five months. The tram cables are supported by only two towers between the terminals. Tower One is located at an elevation of 7,010 feet is 232 feet tall. Tower One leans at an18 degree angle to evenly support the cables between the lower terminal and tower two. As a result, the top of Tower One is offset more than 70 feet our from the center of the tower base. Several 30 foot deep stressed steel rod anchors hold the towers in place. Tower Two located at a breathtaking 8,750 feet, is 80 feet tall. Helicopters were used to construct this tower as the terrain was too difficult to build a construction road to ascend the rocky face to the required tower location. Holes were drilled and steel rods were anchored in the granite (many over 30 feet deep) to anchor each of the footings for the towers and terminals of the tram. Keeping the towers in alignment was of major concern and importance. When construction was finished, the line from the bottom to top including the towers was within 3/8 of an inch. Construction took 24 months, then the tram underwent 60 days of strenuous testing. Only then did it take its first riders up Sandia Peak on May 7, 1966. 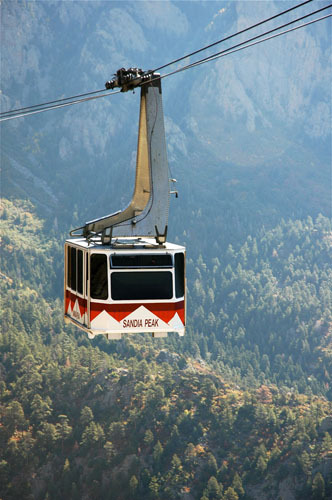 The Sandia Peak Tram is 2.7 miles in diagonal length and is a bi-cable double reversible aerial passenger tramway. Both tramcars are attached to the hauling cables and the weight of the downhill tramcar helps to pull the uphill tramcar to the top. When the tramcars pass at midway, they are almost 1,000 feet above the ground. Top speed of the tramway is 24 feet per second, averaging 12 mph. The main drive is a 600 horse power dc electric winch motor. In case of a power failure, the tramcars can be returned to the terminals with an auxiliary Ford industrial engine. Each of the four 100,000 pound track cables is stronger than required to support one car, and, as an added safety precaution, each car travels over two such cables. The original track cables were replaced in the spring of 1997, during a seven week project with the help of Swiss cable experts. The tramcars were designed with track cable brakes. These brakes would close automatically and hold the car firmly in place in an emergency or haul cable failure. The brakes on the main drive are electronically/hydraulically opened before the tramcars can move. If the power should fail, the brakes are applied automatically, stopping the moving cables and tramcars. Each tramcar is capable of carrying 50 passengers or 10,000 pounds up the mountain at a maximum rate of 200 passengers per hour On the average, the tram makes 10,500 trips per year.